Going with BRA next fall. Bear fence or no bear fence? I have an old UDAP bear fence that I bring on my remote moose/caribou hunts, although I don’t always set it up – sometimes the terrain and setting of the tents doesn’t allow. Some AK hunters and fishermen recommend dousing 2-3 rags with Pine Sol, and placing these around the perimeter of the tent. The guys who posted that recommendation spend a lot more nights in the AK wilderness than I do, so I will be adding Pine Sol to my camp gear list next Fall and trying it out. Necessary definitely not but I sure slept better with one on my trip. We used it for a bit for insurance for the camp while we were off hunting elsewhere. I've never used one on a caribou hunt, I've used them a few times on Kodiak. They certainly don't hurt anything if you can swing the weight flying in. 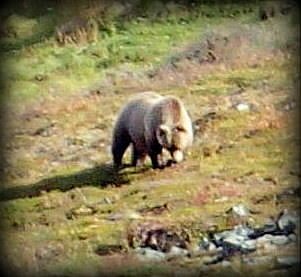 Solo caribou hunt in 2015: This bear showed up before I even had the first piece of gear unpacked. The picture was taken from my selected campsite just after hiking in. I actually had to yell at him to get his attention and keep him from getting too close unknowingly. A couple tense minutes and he finally buggered off. I pitched camp and set up the perimeter fence, which is the first and only time I've ever used one around camp. Three days later my blonde buddy strolled in to see how things were going with me. I was in the tent and had no warning until I heard a sort of whining noise which was followed by a near-silent 'whuff!'. I unzipped the door and let the handgun lead the way outside. The bear was just disappearing over a hump 100 yards away. The fence ALWAYS goes with me, but the intended purpose is meat protection. I'll use it at camp if I sense the need, but in many years of AK hunting (and lots of bear activity) I've not had one mess up camp yet...knock on wood of course. I made my fence rig including the poles, but the truth is the poles aren't stout enough to suit me. So in '19 I'm going to buy 6 of the solid fiberglass snow marker stakes and have them flown in with me. We approached to about 300 yards and started yelling and waving our arms. 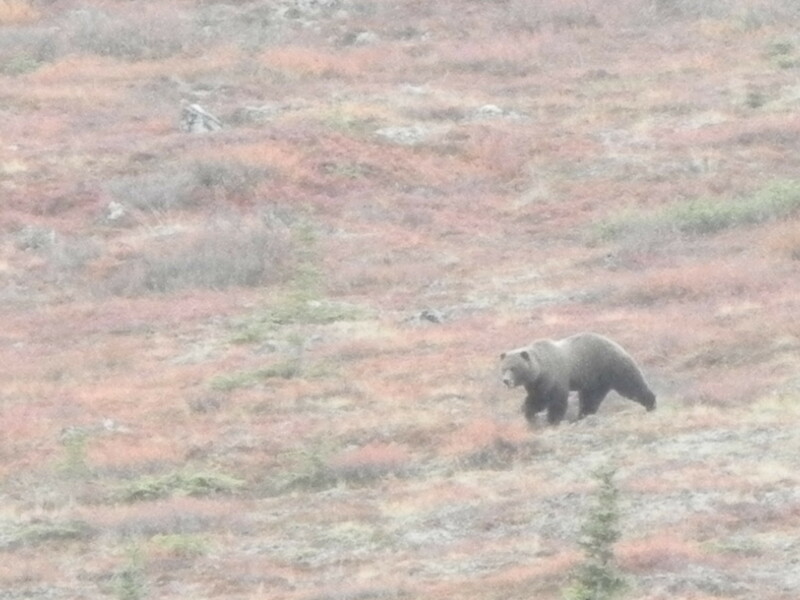 I snapped this pic as the bear was closing the distance and circling to get downwind. We saw him pop his head over the ridge about 80 yards away, dead downwind. We yelled and walked toward him, and he opted to make tracks for another ridgetop. Oh to be able to hunt grizzlies! We had the wind in our favor, and I believe we could have closed to within 75 to 100 yards and had a clear shot in the open. Doesn’t get much better than that…and he was a nice bear. Faith they work? Yes. Infallible no. Neither is a gun, brick wall or moat. There's always THAT bear or that situation where the fence isn't the answer. But to me it's effective enough to warrant the weight and hassle factor. i'll have to remember that one akborn. Absolutely agree! We had two bears on Kodiak completely destroy our camp one night but they never came into our tent which had our food inside (along with us), and was the only thing protected by the fence. We ended up killing those bears the next night, but once again, they never came into our fenced area. There are hunts that I don’t take a fence, but I’ve been using them on Kodiak, religiously, for almost 15 years now and will continue. I don’t know if I’d make it a priority to take one into the Brooks, but if you have one, why not? There are hunts that I do and don’t take a fence, but I’ve been using them on Kodiak, religiously, for almost 15 years now and will continue. I don’t know if I’d make it a priority to take one into the Brooks, but if you have one, why not? I remember reading your story about that hunt when you posted in on the AK Outdoors Forum a few years back - can't imagine what that night must have been like for you guys. I'm glad they stayed away from the tent, and were dispatched the next night. I've been shocked by the ones we put up for cattle on corn or milo stocks with a 110 or 12V charger. They will sure make you take notice. I heard a podcast where a Kodiak guide was interviewed and he said a bear investigates with his nose, so the majority of the time the wet nose is what hits the fence first. That is what makes them work, the wet nose is a lot more sensitive than the rest of the bear. I know the horse I ride now can sense the fences from around 20 feet away. Out of all the horses I've rode in my life I've had 2 that start getting skittish around a hotwire from a similar distance. We have one 3 wire fence around some brome where the middle wire can be made hot. I can ride by that thing all year and he doesn't take notice until we put bulls in there and put the fencer on it. Then he wants to be on the opposite side of the road from it. I put the fencer on a few days ahead of putting bulls in there to make sure everything is working so I know the bulls presence didn't cause his reaction. As far as cows go most of them respect a hot wire very well. A few absolutely won't cross the line where it was even after the posts and wire are removed. A few others will completely ignore it. I'd guess it would be a good deterrent but not a fail safe method for bears. I don't know much about bears, just giving my experience with hot wire after being around it for 30+ years. I agree that it sounds different - but several guys who spend many more nights than me in the AK wilderness said it works, so I am adding it to my camp gear this coming fall. I like this idea here AKBorn. I would think it would be a useful thing as I’ve read and heard from guys that would pack moth balls to spread around their meat cache and tent. I would think it’s basically same concept, cover up the smells that would draw a bear in and be a smell that would bother a bear enough to stay away. They'll chew the seat off a 4 wheeler, chew on a full gas can, chew the plastic fuel oil fill on a chain saw but will avoid pine-sol? Would I take one on that hunt? No, but if it makes you and your significant other feel better/safer, for sure take it. I do use a fence on drop camp hunts on Kodiak where meat and personal food will be sitting in one place for a while. I will say there was plenty of fresh bear activity close to my camp on my last trip, and I had no negative bear encounters even with dead deer in camp for the majority of the time. nope. the one bear that'll eat ya wont be stopped by mild electricity. but if it makes you sleep better then pack it. I have used the large pool chlorine tablets. They will last months outside in the weather, put them under something for a little protection and they will last longer. They work very well for the black bears in my hunt areas. However, I do not see these products as covering up scents. I see them as overwhelming the olfactory senses to such a degree that it is a significant irritant, thus the animal wants to escape it.